Kevin interviews Chris about his experience at Wrestlemania 31. Chris will get the last word on it because everyone else has done this show already including our own Jeremy and Shahid. How many Wrestlemanias has Chris gone to? What was his over all feel for the event? How was access to the venue? What were the biggest reactions on the night? Chris goes over the experience of Seth Rollins cashing in the Money in the Bank briefcase. Why does Brock Lesnar always get busted open in big matches? Did Roman Reigns acquit himself well? What did Chris think of HHH’s entrance? How good of a view of the entrance did he have? Why did Sting come out to Japanese drummers? How did the nWo vs Degeneration X play with the live crowd? Speaking of old men, how did Undertaker look? Were his entrance and Bray Wyatt’s any better in person? How did Randy Orton’s RKO of Seth Rollins go over in the house hold of the casual WWE fans Chris was staying with? Where exactly did Chris stay? 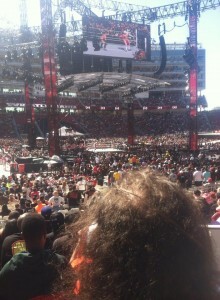 What activity did he enjoy the most outside of going to Wrestlemania? Was it the Full House, house? How about Alcatraz? Click on the link below to find out!